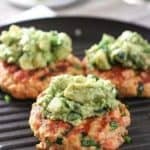 Grilled Salmon Burgers with Avocado Salsa! – These easy burgers are packed full of flavor and healthy to boot! This is a recipe re-do…an up-do really! It’s a take off of our Fast and Fresh Salmon Burgers that were posted wayyyyy back in March of 2015. Seems just like yesterday guys…. 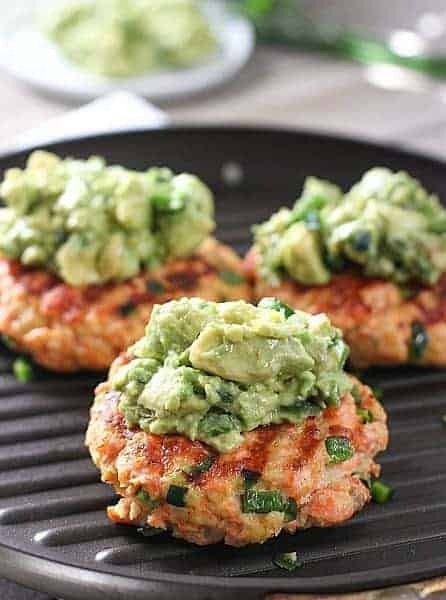 I added a bit of chopped poblano and a heaping scoop of avocado to make these super flavorful Grilled Salmon Burgers with Avocado Salsa! 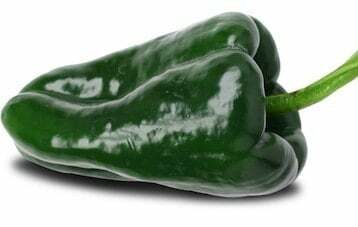 If you are not familiar with poblano peppers, boy are you in for a treat. I describe them as a cross between a bell pepper and a jalapeño. In fact I’ve given up green bell peppers entirely and just use poblano’s. Pepper love! I am not a huge fan of hot and spicy, so trust me that these are mild. I remove all the seeds and veins inside to reduce the heat, and all you are left with is a ton of flavor! Here is a picture of the burgers naked, in case you want to go that way….with or without their avocado clothes, these burgers are darn tasty! 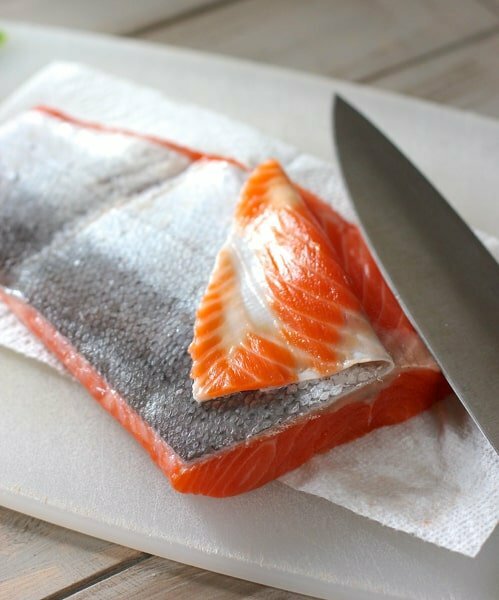 The recipe calls for a pound of salmon. It makes four nice size patties. One pound is about 1/2 of a large fillet. I used steelhead salmon that I buy at Costco. It has a ton more flavor than the Atlantic kind and costs about the same. Once you have removed the skin, simply give it a good chop. No need to dirty that food processor. In fact the food processor makes it way to mushy. We are going for big chunky salmon flavor here! 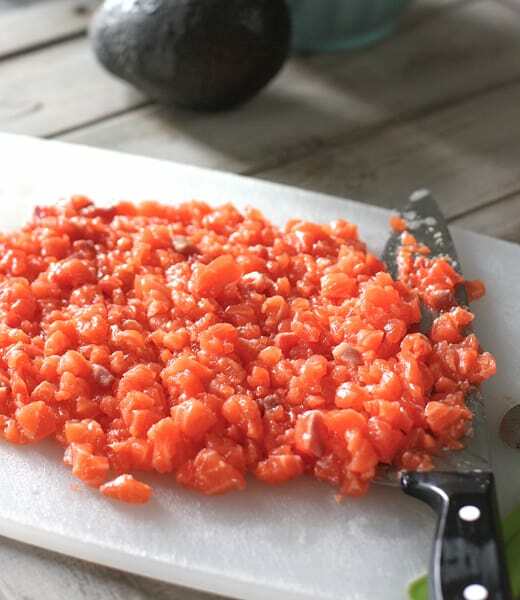 Tips to make Grilled Salmon Burgers with Avocado Salsa! I used panko crumbs as the binder (and you need a binder), but you can substitute almond meal, whole oatmeal (not the quick cook kind), cooked quinoa or couscous. Easy to turn into Paleo, Whole30 or GF. It is really hard to mess these up. The only risk is overcooking. Just about 4 minutes on each side should do it. Press on the middle of the patty if it feels firm, it”s done. I love this Grill Pan! Buy one large poblano for this recipe. You will use half in the burgers and half in the salsa! I’ve got a few other burgers that will keep things simple for you in summer or winter! You can check them out here! 4 Fresh and Fabulous Burgers. It includes my recipe for Chicken Avocado Burgers which is the most popular recipe on this site! Looking for another quick meal? You might like my recently posted Greek Chicken Sheet Pan Dinner! Here’s to Fast and Fresh Meals! Fresh and fast salmon burgers that you make yourself with a creamy avocado salsa topping! 1/2 cup panko crumbs (See above substitutes for Paleo W30 and GF). Add panko, poblano,egg, green onion, lemon or lime juice, salt and pepper. De-lish! I made these last night & added spinach, red peppers and mushrooms as well. And since I didn’t have any poblano peppers & added siracha to the mix for a little head! They were so yummy. Thanks for sharing this with us! Hi Shannon! Thank you for the great add-in ideas and I’m so glad you liked them! Thanks for the nice note Liz! I always enjoying coming back to old recipes and reinventing them. That reminds me there are a couple of my own I’d like to re-do! This is a fantastic idea though. I’ve never had salmon burgers but I’m a huge fish fan and now wondering why not. Salmon and avocado is also one of my favourite combinations. This really is perfect for me! Hello Emma, thanks for your nice note! 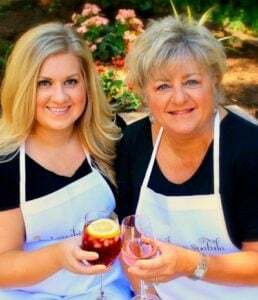 I am hoping to reinvent a few of my old recipes this summer. It’s kinda fun to see how far we have come! Oh man those salmon burgers look amazing! My kind of meal! Thank you for the note April! I love salmon burgers! Love the idea of the avocado salsa topping! Hi Beth-thank you for the note! Hope you get a chance to try them! This is fabulous — as healthy as it is gorgeous! Hi Sue – I’m a huge fan of your blog! Thank you for the note! My husband would LOVE these, perfect for the warm weather coming up! Hi Kim – they are a nice change from regular burgers and super quick to make! Hope you get a chance to try them! 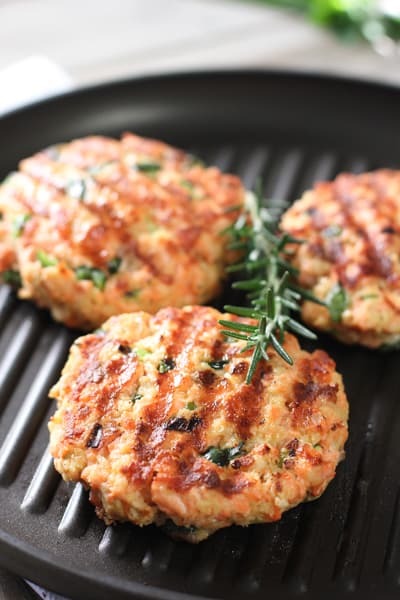 These salmon burgers look glorious! Im a huge fan of salmon and avocado together! Thanks for the note Bethany! Hoping you get a chance to try them! Salmon and avocado are two of my favourite things they complement each other so well. These look delicious. Thanks for sharing. Thanks for the nice note Lucy! This is my kind of meal! With some salmon in the freezer that needs to be used, and avocados ripening on the counter, this is looking like a great meal for dinner tonight. Love that you included adaptations for special diets, too.